SwiftStack wants to make open source storage software work really well on commodity hardware, says founder and CEO Joe Arnold, whose OpenStack Swift-based software-defined storage company recently raised a $16 million Series B funding round. The round was led by OpenView Partners, a venture capital firm that specializes in boosting growing enterprise software companies after they have found their market fit, but before they have gone to market. Existing investors Mayfield Fund, Storm Ventures and UMC Capital also participated. 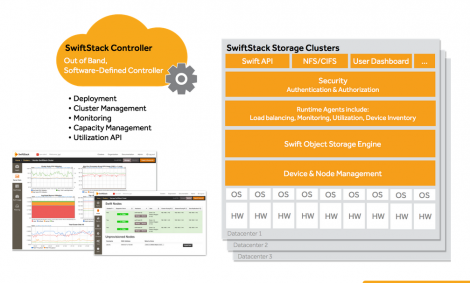 SwiftStack's software-defined storage controller uses OpenStack's object storage component Swift at its core. It virtualizes storage resources distributed across data centers, presenting them as a single centrally controlled system. Operators can manage and scale their storage environments through a single pane of glass, orchestrate cohesive upgrades and monitor utilization and performance. "Unlike many B2B software [companies] or startups in general that touch on one macro trend, SwiftStack sits at the crossroads of so many trends," said OpenView Vice President Mackey Craven. "The growth of unstructured data, the movement and abstraction of storage at the software level, open source technology in the enterprise -- all the winds are at their back." Craven sees SwiftStack as the future of enterprise storage. "Despite being a small company, the technology has been proven at an incredible scale," he said. Tech giants are acquiring and VC firms are funding those that simplify open source adoption. "Enterprises really want to consume open source but it can be really difficult, and it’s our job to make it really simple," Arnold said. "If you look at data center technologies that have gotten a foothold, the last proprietary one was probably VMware. We’re really seeing a desire by these enterprises for open source starting to show itself." SwiftStack launched in 2011. The company said it signed up several Fortune 500 customers, including eBay, Pac-12 Networks, and HP. Arnold said the company continues to see healthy momentum with enterprises, and the round will help in pursuing that market. SwiftStack enables storage cluster management across multiple data centers. Enterprises have been tackling unstructured data storage using traditional array-based storage technologies, which can be cost-prohibitive. SwiftStack's distributed approach is more cost effective, flexible, and simplifies the process. Version 2.0 launched earlier this year, adding a Filesystem Gateway that integrates object storage with existing file-based applications. The new version also saw enhancements to enterprise authentication with plug-and-play integration with enterprise management systems, such as LDAP and Active Directory. Defining and carving up storage resources using software tools like Swift and SwiftStack is a major shift in storage management. "There’s been a separation of hardware and software and a disaggregation of what’s on the equipment and the equipment itself," said Arnold. "People want to get away from appliances. It’s happened in compute; we’re starting to see this with networking as well -- a separation from the control plane being placed into software. Storage is sharing some of the same design principles. Storage is now becoming about distributed systems." Several vendors offer scalable storage software for vendor-specific hardware, such as EMC's ScaleIO, and for commodity hardware, such as Scality. SwiftStack competition also includes Red Hat's alternative to Swift called Ceph, which the open source software giant gained through the acquisition of InkTank. InkTank, which spun out of hosting provider DreamHost, offers commercial support for Ceph. There is an uptick in both VC funding and consolidation in the OpenStack ecosystem. Another example of a player that recently raised a major round was Mirantis, which raised $100 million. Cisco acquired private OpenStack cloud provider Metacloud in September and EMC acquired CloudScaling earlier this month. The OpenStack Foundation's summit in Paris is next week, where SwiftStack customer Time Warner will be a keynote speaker. OpenStack's tenth and latest release, named Juno, came out earlier this month.